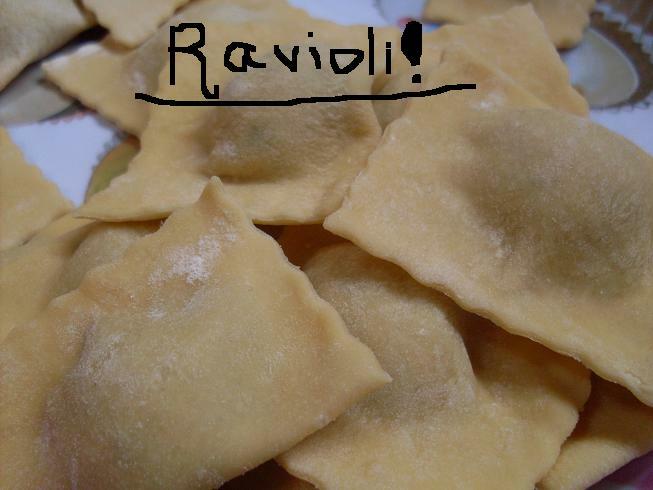 A little while ago we made ravioli. It was pretty easy. All we had to do was make up a dough. We put 800g of flour on the table or in a bowl. Put in 1 egg at a time. Use eight. Mix it all together with either your hands or a spoon. 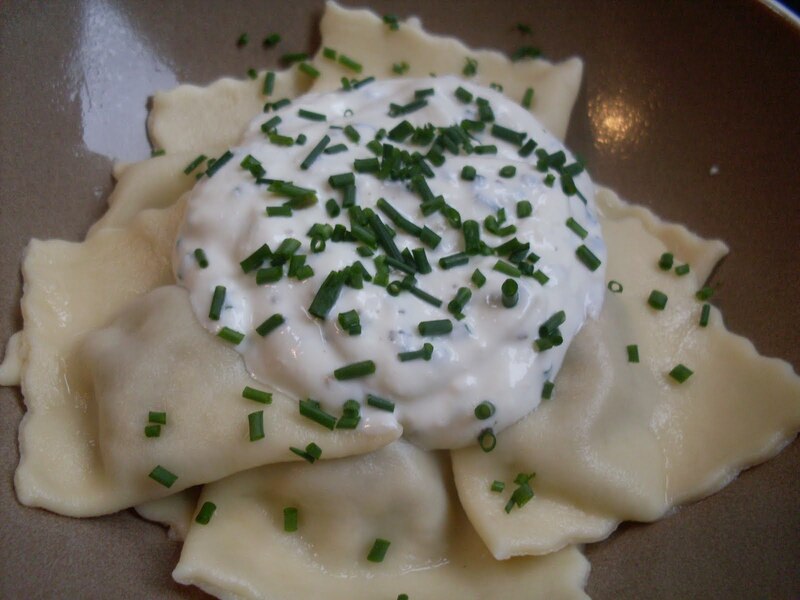 Then make your filling. Do this however you like!Then you take all the dough out and bring it over to a special machine. Keep folding into thirds and put it through the highest setting. After 3 or 4 times you keep it in that shape. Then using some sort of hand turning thing (The same thing)that made our dough smaller, we put in on the highest setting again and once we put it through we went to the next setting down then the next and the next and so on. 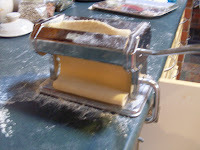 This is the special machine that we used all you have to do is put the dough in and turn the handle. Then after you finish making the dough thin you bring it over to a clean table. Lay it out on the bench in the long line. Get your filling out and roll it into small balls. Don't do them to big. then place each one about 2-3cm apart. 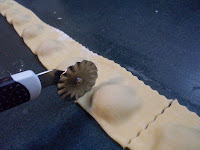 Then using a pizza cutter, trim the top, bottom and two end sides. Don't do the sides too far in. 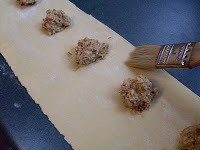 See how we put the filling at the top of the dough so we can just fold it over. Before you do brush it down a bit with abit of egg. Not too much though. Now we fold over the dough and start to cut it. After you've used up all your dough and you have lest over meat, you could me hand burgers with it.This is what it should look like once you've finished. 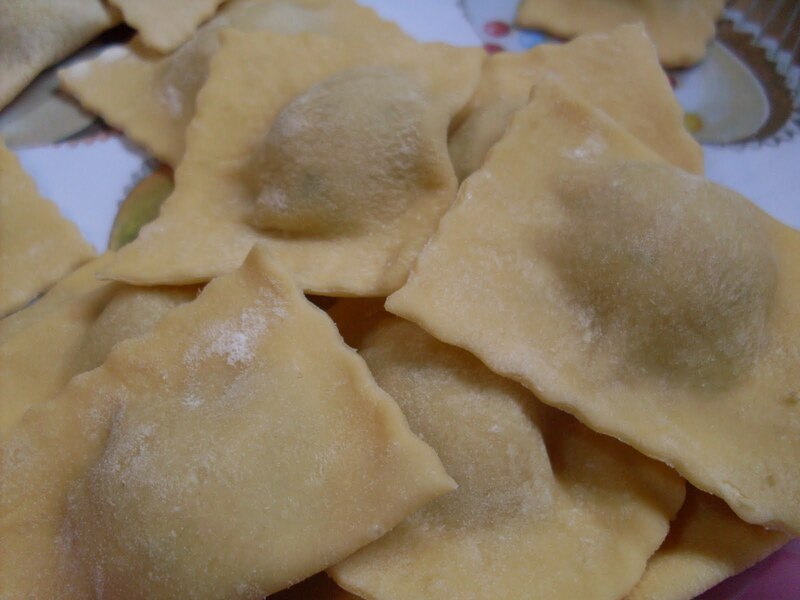 On the left is the finished and on the right is all the cooked pieces of ravioli with some toppings on them. They are great! I am gonna go ask my mom to make that!